As an early birthday present from my husband, I got to embark on a two day jaunt to New York City last week. One of the things I miss most about life in the City is easy access of some of the world’s best food, vegan or otherwise. Every time I visit, I make sure to squeeze in as much deliciousness as my wallet and stomach can afford. Even though this trip was short, I still got to visit a few old and new favorite vegan restaurants. In hind sight, I should have taken some more photos of what I ate, but I always feel super awkward photographing plates (and, to be honest, I forgot). My first stop (literally, right off the bus) in the city was ‘sNice in the west village, home of the Vegan Panini, one of my all-time favorite sandwiches. I first met the Vegan Panini about five years ago and my love hasn’t wavered The balance of flavors and textures is perfection in sandwich form. The smoked tofu is firm and chew as all good tofu should be. Sun dried tomatoes add a hint of sweetness while garlicky, creamy pesto bring the whole thing together on a crusty baguette. My oldest,closest friend and I enjoyed our panini as we caught up on each other’s lives. 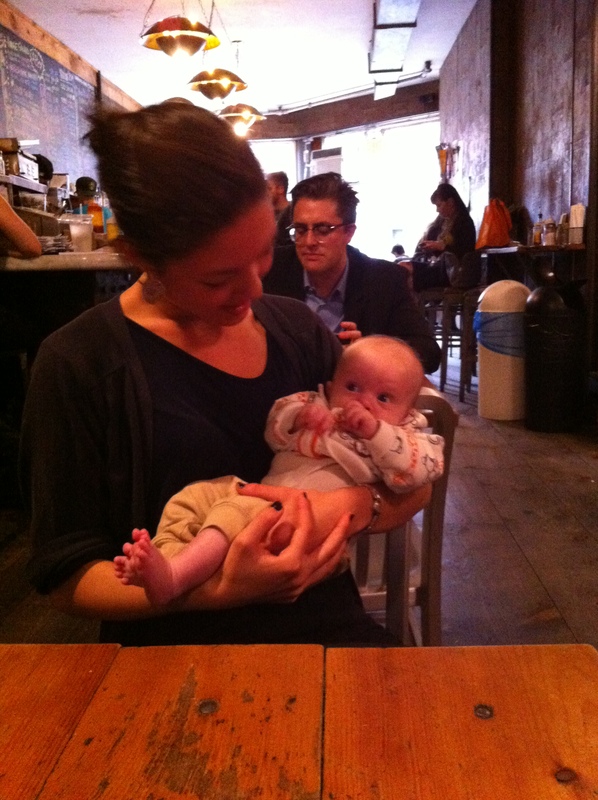 I also got to introduce her to my almost four month old son! Later that night, I met a few friends for dinner at Red Bamboo in Greenwich Village. I’d only eaten here once before, my freshman year of college, and figured it was time for a return. Red Bamboo and its sister restaurant, Vegetarian’s Paradise 2, are NYC vegan staples. Soul food and Asian-inspired cuisine both have their place on Red Bamboo’s expansive menu. It’s a little heavier on the mock meats than I usually prefer, but I do have a soft spot for mock chicken. We started with the vegetable dumplings, which were good, but nothing to write home about. Unable to decide what to order, I ended up sharing the sesame beef and cashew chicken with a friend. The sesame beef was the favorite of the night–it tasted just like the Chinese-American takeout dish I remembered from childhood–with crispy morsels of soy-based protein, lightly fried and smothered with a delicious sesame sauce, served alongside a hearty helping of veggies and brown rice. We finished the meal with a dish of chocolate and vanilla ice cream to share. I enjoyed the food, but I probably won’t go out of my way to eat here again. Soy and Sake still wins as my favorite place for vegan pan-Asian food in the city. A couple of days ago, I roasted a butternut squash with lots of salt and black pepper, but had no main course prepared and limited time. I ended up tossing it with whole wheat penne noodles, fresh spinach and chickpeas, topped with my usual lemon-garlic-olive oil sauce and plenty of crushed red pepper. Simple, nutritious, and satisfying on a crisp autumn day. Let’s ignore the fact that I’m failing the whole “post every day” part of VeganMoFo and move on to the muffins. For my first Paula Deen challenge, I decided to forego the deep fried, bacon-wrapped, lard-marinated butter balls and go with something simple–these banana coffee muffins. The only animal ingredients in these are, as in many baked goods, eggs and butter. I replaced the egg with 1/3 cup of soymilk whisked with 1 tsp. apple cider vinegar. Since bananas already act as a binder, I figured I mostly needed to replace the moisture and leavening components an egg provides. For the melted butter, I substituted canola oil. While I appreciate earth balance and other vegan “butters”, I also like to use minimally processed ingredients, when possible. I used whole wheat pastry flour because I ran out of all-purpose, and replaced the nuts with chocolate chips, because my husband loves chocolatey-banana things and who am I to stand in the way of that love? The result: Good, but not perfect. I’m a big fan of the marriage of banana, coffee and chocolate and these taste just decadent enough to feel like a treat without being overwhelmingly rich. Really nice paired with a homemade latte! The biggest problem with the recipe was that they didn’t rise much or get fluffy the way a muffin usually would. I think the soy milk made the batter a little too wet, which I could have counteracted by adding a bit more flour. Next time, I will also try adding a teaspoon or so of baking powder, which should help leaven them a bit more. I may cut back on the oil by a tablespoon or two because I thought they tasted pretty greasy. But this is a Paula Deen recipe we’re talking about, so maybe that’s intentional. Veganizing a recipe almost always takes trial and error but I’m enjoying the challenge! Next time I think I’ll tackle a more ambitious Paula recipe–maybe an entree? Continuing with the accidental comfort food theme of this month, I whipped up a vegetarian meatloaf for dinner last night. I’ve never tasted “real” meatloaf (my husband claims this makes me less of an American) so I’m not sure what it’s supposed to taste like, but my Not!Meat Loaf turned out fairly well! The meatloaf loving husband polished off about three servings all by himself, so we’ll call it a success. 1.We were low on ketchup so I replaced half of the 1 1/2 cups called for in the recipe with a combination of tomato paste and sriracha sauce. The sriracha makes it quite spicy, unlike a traditional meatloaf, which we appreciated. 2. 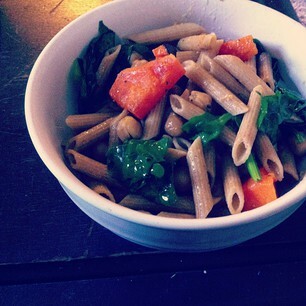 I used green onion instead of red and added about a 1/2 cup of chopped carrots, just because. One of the things I love most about the recipes in Quick and Easy Vegan Comfort Food are their adaptability. Unless I’m thinking ahead and remember to check ingredient lists before I go shopping, I almost always end up subbing or swapping ingredients in recipes, based on what I have on hand. This meat loaf stood up to the challenge. It’s also fairly healthy, as far as meat loaf goes with lots of fresh veggies, soy protein and only a small amount of oil. Next time I make this, I may try forming the dough into patties for veggie burgers. 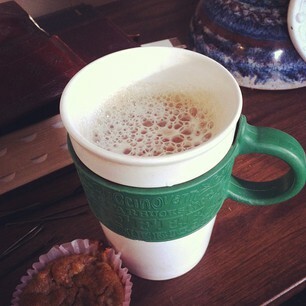 Tomorrow’s VeganMoFo post: veganized banana coffee muffins, courtesy of Paula Deen! Cinnamon rolls are best eaten while wearing flannel pajamas and fuzzy slippers in front of a roaring fireplace. They’re the Thomas Kinkade paintings of baked goods. I mean, I’m not trying to encourage emotional eating, but if you’ve had a tough day, you probably need a cinnamon roll. In my family, cinnamon rolls were a Christmas morning tradition. These days, I’ll find any excuse to whip up a batch as soon as the weather starts cooling (it just feels wrong to eat a sticky, sweet baked good in mid-July). After some successful pumpkin cinnamon rolls last season, I started thinking about how to marry other autumn and winter flavors to my favorite recipe. This time: gingerbread. 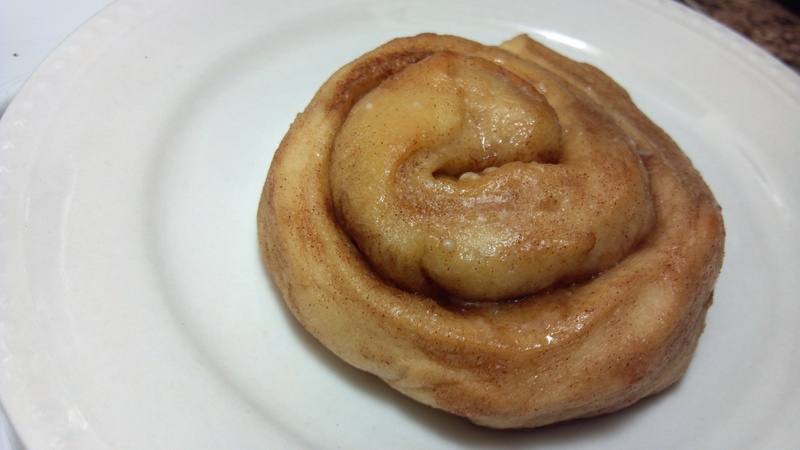 I used my basic cinnamon roll recipe, veganized from the one I grew up making with my mom. The molasses and powdered ginger in the dough add the “gingerbread” taste, but I think it’s a little too understated in this version. More molasses, maybe? Another spice addition, like ground cloves? Try it and let me know what you think. I think a good cream cheese frosting would be awesome on these, but today I opted for topping these babies with a simple vanilla icing. Dissolve the yeast and sugar into the milk. Let stand until foamy. Meanwhile, whisk together the baking powder, water and canola oil. Add the baking powder mixture and melted margarine to the yeast mixture and stir. In a separate bowl, sift together the flour and spices. Gradually add the the wet ingredients until a non-sticky dough forms. Knead dough on a floured surface for about ten minutes until it’s stretchy and smooth. (You can also use a stand mixer fitted with a dough hook.) Form dough into a ball, place in an oiled glass bowl, cover and let rise in a warm place for about an hour, or until doubled in size. Prepare the filling by creaming all ingredients together in a small bowl until well combined. Preheat your oven to 400 F and lightly grease a heavy cookie sheet. Punch down the prepared dough onto a floured surface and roll into a 15 x 9 inch rectangle. Use a butter knife or the back of a spoon to spread the filling over the surface of the rectangle. Roll dough into a cylinder and slice into 12 pieces. Place evenly on the prepared cookie sheet and let rise for an additional 15 – 20 minutes. Cover with shrink wrap and place in the fridge until ready to bake, or progress immediately to the baking step if you want them right away! Bake for 12 – 15 minutes until lightly browned on the bottom. Drizzle your favorite icing over the rolls while they’re still warm. These are best served immediately, but keep well for a couple of days stored in an airtight container. I’m sitting here in my bathrobe, eating lukewarm oatmeal for dinner because it’s 10pm and the cupboards are mostly empty and the idea of cooking, and having to wash more dishes, makes me want to run screaming from my home and adopt a primitive, nomadic, dish-less lifestyle worthy of a TLC reality show. I haven’t had a chance to get to the grocery store this week and over the past too distracted by other responsibilities–taking care of the baby, running a business–to plan meals in advance like I usually do. In situations like this one, I end up in a food rut, falling back on the same three or four unexciting dishes until either my husband or I start complaining enough to motivate me to get to the store. This week, we’ve mostly been eating peanut butter toast, some combination of lentils and rice, and a mediocre vegetable soup made from last week’s leftover produce haul. I guess the point of this post is that I’m shaping up to be a sad, uninspiring food blogger. What are your token “in a food rut” meals? What do you do to break out of your ruts? Also, this oatmeal isn’t half bad: brown sugar, cinnamon, peanut butter, chocolate chips. Give it a try next time you find yourself standing in your kitchen in your bathrobe, with low blood sugar, staring at a nearly empty fridge. Tomorrow kicks off Vegan Month of Food–a project that involves hundreds of bloggers writing about vegan food every day throughout the month of October. Typically, VeganMoFo bloggers choose a theme, like a certain ingredient or type of dish, to guide their posts. Since this is my first year MoFo’ing, I’ve decided to have both NO THEME and ALL THE THEMES, simultaneously. You can expect. . .
and the project I’m most looking forward to. . .
“Veganizing” at least one Paula Deen recipe each week. For my Paula Deen Goes Vegan project, I’ll choose one recipe from the queen of butter’s website or television show and attempt to replicate it using only plant based ingredients. To make things more challenging, I’ve decided the recipe must include at least two varieties of animal products. I’m hoping this project will 1) help folks realize that vegan food and comfort food are not mutually exclusive and 2) help me further my ambition of growing up to be a (a less diabetic), vegan Paula Deen. I’ll also be posting recipes for a lot of lighter, healthier fare this month, if you’re on a low-Paula diet, as most human beings should be. 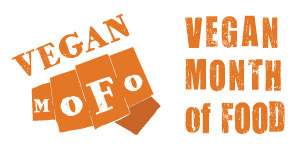 There are some great bloggers participating in this year’s Vegan Month of Food. Make sure to check out the blog roll! I’m looking forward to the next thirty days of sharing the veggie love!